May is the American Academy of Dermatology’s Skin Cancer Awareness Month, and with sunnier weather already upon us in New York, it is the perfect time to think about the health of your skin. Like other cancers, skin cancer is an abnormal growth of cells. It usually develops on areas of the skin exposed over time to damaging rays from the sun. Individuals with light skin who sunburn easily have a higher risk, but skin cancer can affect people of all skin types. melanoma, the deadliest form of skin cancer. In addition, dermatologists look for premalignant growths known as actinic keratoses (AKs). If left untreated, AKs have the potential to develop into squamous cell carcinomas. An estimated one in five Americans will develop skin cancer in their lifetime. Nearly 9,500 Americans are diagnosed with skin cancer every day. For patients with a lot of moles and sun damage (like me), monitoring skin changes over time is virtually impossible. And for “high risk” patients with family or personal histories of skin cancer, close monitoring is critical. Fortunately, there is an exciting new technology that we are launching at Spring Street Dermatology to supplement full-body skin exams: FotoFinder. FotoFinder is a whole-body photography program that takes high-resolution images of the body, head to toe, in 20 different positions. In addition, suspicious moles are marked and documented using a dermatoscope that creates highly magnified images. 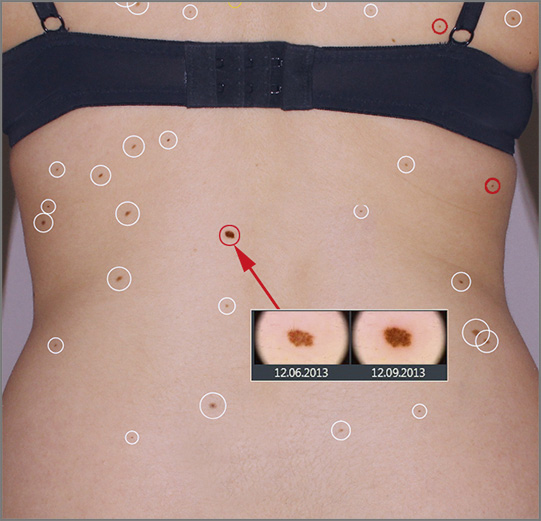 Baseline images are then compared with follow-up images, taken six months to a year later. The software is able to detect microscopic changes that can be analyzed by our dermatologists and reviewed in subsequent full-body skin exams. A diagnosis of skin cancer is never news anyone wants to hear. FotoFinder uses cutting edge technology to detect subtle changes at their very earliest stages, minimizing the risk of developing into more dangerous skin cancers down the road. For more information about FotoFinder, please contact Spring Street Dermatology at (212) 431- 4749.